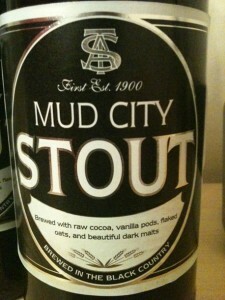 Mud City Stout by Sadlers Ales - kapow!!!!!!!! 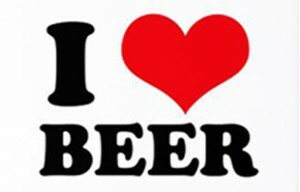 For me I prefer a sweetness in any beer because of my profoundly sweet tooth. This is to be noted for all the rest of the reviews: SWEETNESS is the ledge upon which I firmly sit and take a peek at the beer world. Remember that. 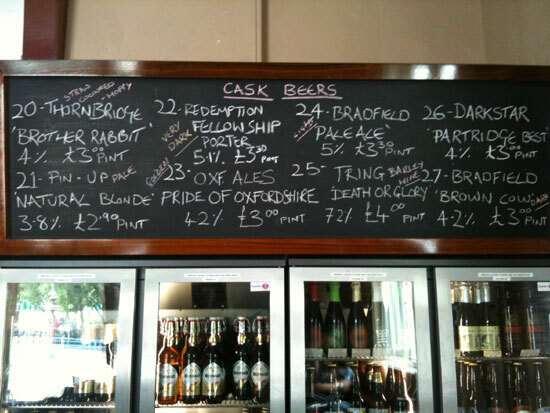 I also love the guys at Sadlers Ales for a myriad of reasons. I’m pleased to say their beers (Hop Bomb & The Spig) caused stirrings of love amongst many at this year’s GBBF. But I don’t just love them because of that. I love Sadlers because they are based not a million miles away from me in a place called Lye in the West Midlands. My memories of Lye are strong & evocative: I used to drive through Lye from my Mum’s house on the way to the Midlands very own Westfields: the delightful Merry Hill (or Merry Hell to some people) Shopping Centre. I once went with a mate of mine to buy her first car off an unseemly-looking second-hand car firm close to Lye High Street and much hilarity ensued when the sorry vehicle broke down no sooner we got it off the lot! Plus I have never seen so many Balti house lined along one street in my LIFE as there are in Lye. I’m ashamed to say I haven’t yet found the time to visit the guys at Sadlers to muck in and snoop around. But I will. 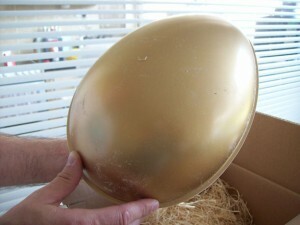 I heard that the 5th generation of Sadlers is due to make their entrance in the world. Wonderful news! I order you to go buy this beer with which to wet the new baby’s head forthwith! End of sales pitch! 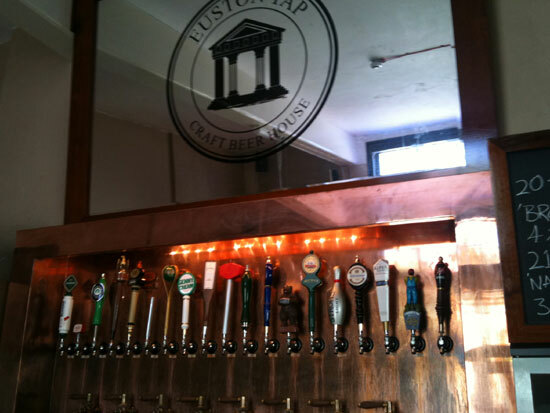 Next up is Euston Tap just outside London’s Euston station! My cheeky stop off to the Euston Tap last month was promoted by 2 things: an urgent need to anaesthetise the fourth toe of my right foot, which I’d accidentally broken earlier that morning. So what the hell was I doing walking around in London at lunchtime with a broken toe? Good question: At 530am, and thus half asleep, I was rushing to my train from Brum to London for a telly job. I was due to spend the morning standing in front of an autocue for a corporate video. I smashed my toe on the foot of my bed (BIG OUCH) and consequently had to hobble my way there after getting on the train. So while waiting for the train back I snuck in and spent 30mins supping on Dark Star’s Partridge Best and Bradfield’s Brown Cow. Both brilliant and right up my taste street. So last month these three little beauties got a blasting in the press. 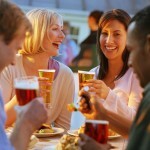 By many (including me) who don’t think women need ‘special’ beers. 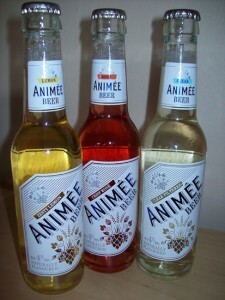 Molson Coors have produced the ‘Animee’ range. 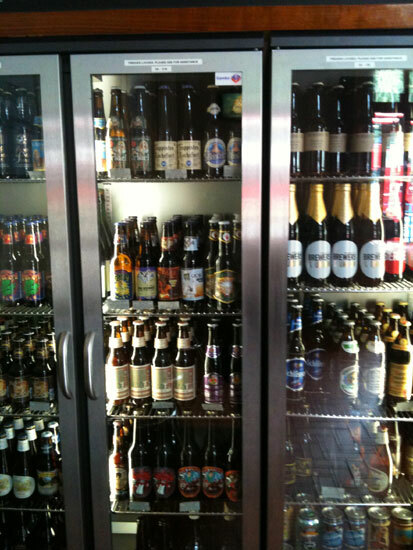 The same company responsible for beers like Carling, Grolsch and Heineken. 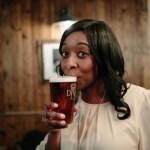 Molson Coors also set up The Bittersweet Partnership, to try and help women unleash their love of beer. I love what BSP do and I love the fact they’ve spoken to over 30,000 women about what they like and don’t like about beer. Molson Coors say that “aims to dispel the perception among women that all beers look and taste the same and that there is nothing to tell them apart.” The company spent 2 years developing it in response to their research which showed that 79% of women they surveyed never or rarely drink beer. 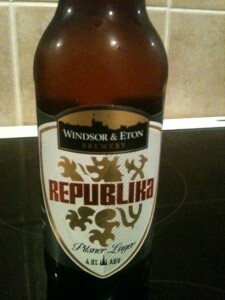 the CLEAR FILTERED one – to me tasted somewhat blander than Carling. And I’m not a Carling fan, never have been and never will be cos to me Carling just doesn’t have any flavour UMPFFF. It just tasted of nothing really. Quite bland. 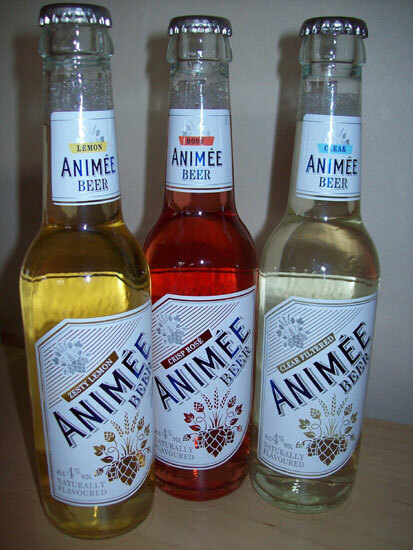 I sniffed and snipped, then I sniffed and sipped again, and ended up spending the life of the 275ml bottle trying to remember what the smell of the LEMON Animee beer reminded me of. Then it hit me: it smelt like the Shandy Bass that I used to drink as a kid. 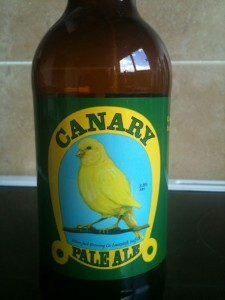 The Shandy Bass I used to get very excited about, I might add, cos it was me being allowed by Mummy Beer Beauty to drink booze – even if it contained less than 1% beer! Finally onto the ROSE beer, which for me brought back memories of the MASONS’ Cherryade my Mum used to buy from us off the back of his delivery van each week. Except this beer smelt like a weaker, watered down version of the Cherryade and much less sweet. All in all these 3 beers didn’t do a fat lot for me. I really didn’t enjoy them because they aren’t to my taste. That’s not to say they won’t be to the taste of ladies around the UK who buy them. As you know Beer Beauty is all for getting more women into beer. If these beers help women make their very first foray into beer, and they LIKE them, thus giving them impetus to get exploring and trying more and more beers, then more power Molson Coors. The big danger with these ones in particular is that I’m not sure they’re going to work. Especially when I recall all the parties I’ve thrown for women who positively lap up very bitter IPAs, Porters, Stouts and very strong beers which are more aligned to their love of high ABV wines and spirits. Anyway, I rest my case. And so on to Greene King, the makers of Old Speckled Hen, who recently unveiled a new beer at the GBBF the other week. 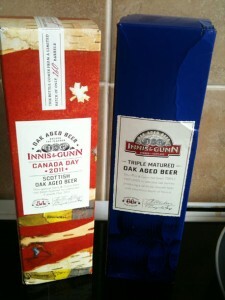 I had a bottle in the post to try out the week before. At 4.1% ABV this Old Golden Hen is lighter than the Speckled and they tell it me was brewed to ‘specifically appeal to premium lager drinkers looking for more taste’. 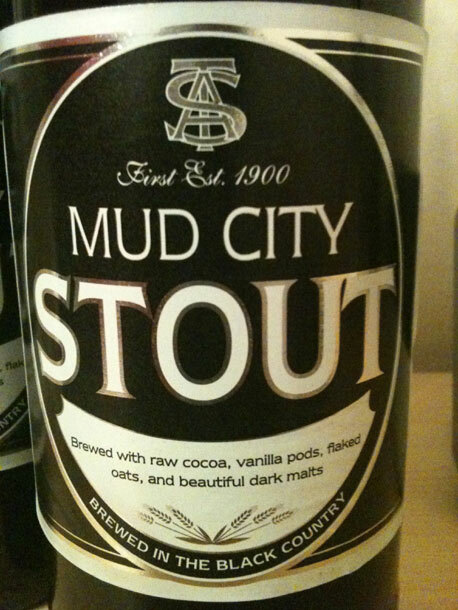 It was a nice clean, tasty beer and I can see why people buy it in their droves but, for me, it was a little too biscuity and had too dry a finish. It wasn’t satisfying or in the least bit moorish. So NULL point on the beer, but an unexpected DOUZE point on the marketing of this new beer. 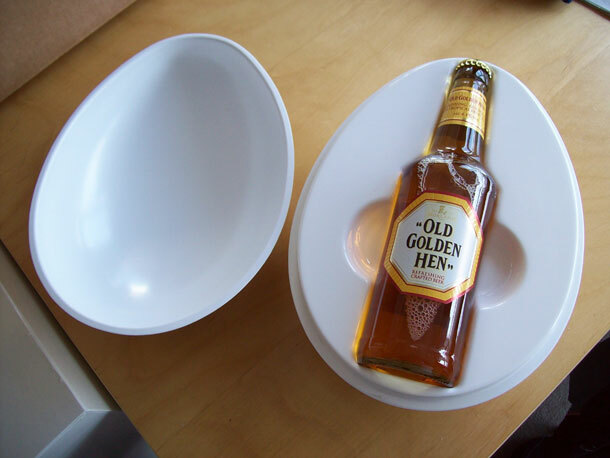 The crazy bottle in the egg and the raft of videos Greene King have made to promote their Old Speckled Hen are pretty groovy. And if you’ve not seen any of them, then you’ve GOT to check them out. They all feature a puppet fox (who’s permanently perched on a bar stool in a pub, cutting a dash like Basil Brush’s very refined Grandad). I’ve had a great time watching all the hilarious TV sponsorship bumpers on YouTube and I’ve posted my fave below….You gotta love The Fox! It’s fair to say I LOVE my pilsners. After my crazy weekend at The Open with Pilsner Urquell, I’ve a newfound respect for this beer style. 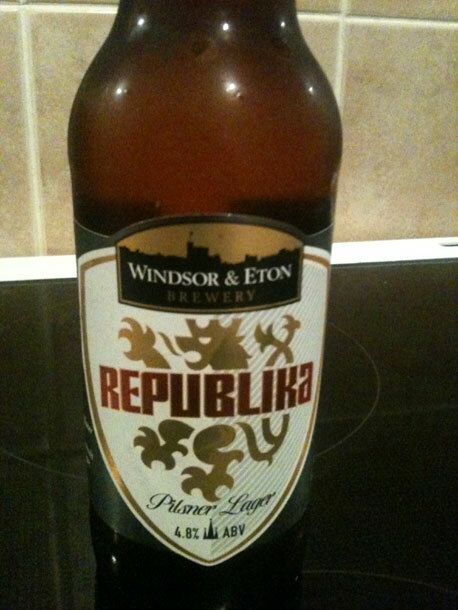 Windsor & Eton have made something rather incredible here – it’s just so light and moorish and tempting. Less bitter on the finish for me, which is a delight. Might have to order myself a case 😉 Cheers to Paddy from the brewery who whizzed me over a bottle the other week. I’ve never been a fan of massive ginger flavours. There was an unusual & irrational thirst among my friends when I was a kid for Old Jamaica Ginger Beer, which a) I didn’t understand because b) I found it truly disgusting. But I tried a Blandford Fly (now Blandford Flyer) last November and fell in love. 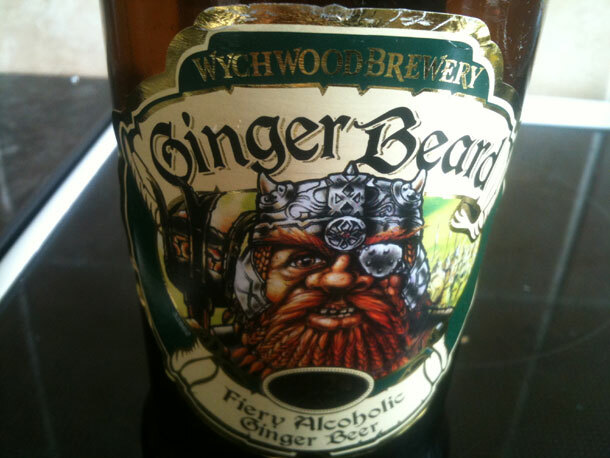 Wychwood sent me a mini-hamper with some cheese (it had died due to the hot weather) and some dark chocolate to go with the bottle of Ginger Beard. I didn’t see any of the dark chocolate after it fell into the hands of The Main Man 😉 so this beer was on the money for me – sweet and gingery without blowing your skull wide open and burning out the back of your throat, a la Old Jamaica, I reckon I could only stand one bottle in any one night but it was gorgeous. 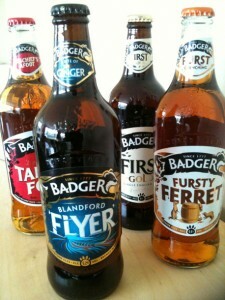 Is a set of Badger's a Badger's Set?? And speaking of darlings, this ‘classic style Vienna lager’ by my friends at Thornbridge is absolutely incredible. A dark, sweet beer which reminds me of a feistier Hobgoblin and the rest. (If you don’t like Hobgoblin I meant no offence but you need to get over it!) And all in conjunction with an artist called Kid Acne, who designed the bottle label. Sorry, I don’t know who he is. But he’s very excited about the collab. Check it out. A belated wish of Happy Birthday! I’ve been following you on Twitter for some time and only because of today’s tweeted link to a video did I realize you’ve got a blog – duh! I’m so glad to hear someone else admit they like their beer sweet. 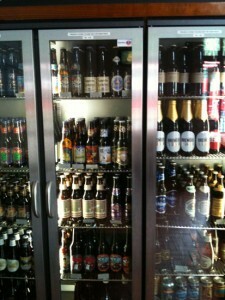 Everyone around here (I’m not sure if it’s all of the US or just the Southeast) who likes craft beer is a total hophead. Glad you’ve found my blog and REALLY thrilled you love sweet beer too. Doesn’t it just show you that we’re all so individual when it comes to our beer tastes cos I’m sure all the brewsters on the Venus Rouge collab told me they were hopheads. So no-one can assume women don’t all like bitter beers. ha ha.